How do you prefer your woodcock? Save and savor these true north wild game eats & drinks recipes with a Michigan connection. Everything considered from bluegills to fat muckets. Think Michigan soul food. A Michigan 'back-east' feast you'll never forget! The Michigan Connection: Fish any pond or lake in Michigan and you'll find hundreds of bluegills, some getting to what we call 'Slab' size. The classic, time-honored method of harvest is a fly rod with poppers and spiders. You can keep and eat up to 25 a day and the kids love when you fry-up their catch. Heck, kids of all ages love a bluegill feast! Preparation: Melt butter in a shallow frying pan. In another dish combine bread crumbs, Parmesan cheese and paprika. Dip fillets in butter then coat with crumb mixture. Return fillets to the shallow pan, add crawdads and fry over medium-low heat for 15 minutes or until bluegills flake easily with a fork. Accompaniment: Serve with pan-fried morels if you can find them. 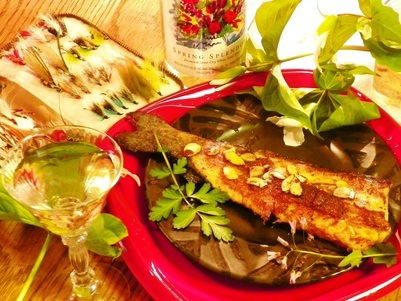 Five ingredients is all you need to prepare this fabulous spring trout treat. The Michigan Connection: The emergence of Michigan's massive colonies of three-petaled spring trillium also signal the first major mayfly hatch in Michigan - the Hendrickson. It's the Hendrickson mayfly that prompts trout to “look up” for dinner making it the dry-fly man's sweetheart. After your catch, rainbow trout also make for a fabulous dinner. Preparation: 1) Coat both sides of fillets with crushed saltines. In a large skillet, melt three tablespoons over medium-high heat. Cook fillets for 3-5 minutes on each side or until fish flakes easily with a fork. Remove and keep warm. 2) In the same skillet cook and stir the almonds in remaining butter until lightly toasted. Stir in lemon juice. Pour over trout. Nothing better than salmon patties and hot brewed coffee in the morning. The Michigan Connection: Coho, Chinook, Pink and Atlantic salmon were all introduced to Michigan's surrounding Great Lakes in the 1960's to offset the decline of commercially over-fished lake trout, whitefish and perch. Fishermen troll the lakes in the summer and throng to the rivers in the fall to catch these enormous fish. When caught fresh and silvery each species makes tasty table fare. Preparation: Mix first four ingredients and season with salt and pepper. Form into patties. Sprinkle with bread crumbs and refrigerate for one hour. Heat oil and butter in a heavy skillet. Sauté patties until crisp and golden, turning once. Serve with fresh lemon wedges. Beverage Selection: Your favorite piping-hot, fresh roast coffee. A traditional fall dessert that's welcome any time of the year. The Michigan Connection: Ok, the natural range of the pecan only reaches as far north as Illinois, and historically, the leading pecan-producing state in the U.S. has been Georgia. But doesn't Georgia connect to Michigan via I-75? So, there 'ya go! Preparation: This classic dessert is a no-brainer and so is this recipe. A perfect filling is ready for you to add fresh eggs and butter and bake in your own pie shell. Click here for a Perfect Pecan Pie every time. Serving Suggestion: Microwave each slice slightly (10 sec) and top with vanilla ice cream or fresh whipped cream. The Michigan Connection: When you need a classic mid-winter "cabin fever defeater", rabbit has a nice ring to it. They are extremely abundant in Michigan and the state encourages cottontail and snowshoe hare hunting from September 15 - March 31 statewide. Don't hunt? Store-bought meat will do just fine. Warning - Be prepared with lots of paper towels. Eating rabbit is like cracking crabs or lobsters. It's pick-apart, finger-licking good food so don't expect to use a fork very often. But, that's the fun of it. Preparation: Dredge rabbit pieces in the milk and egg mixture. Roll rabbit in the coating mixture, then dip back in the egg and milk mixture. One more time back into the coating. Fry in a cast iron skillet in 1/4 cup peanut oil for about 30 minutes turning once or until the rabbit is cooked through and coating is golden brown. Accompaniment: Serve with red skin potatoes mashed with a little garlic, sour cream and butter. For vegetable serve peas and carrots or fresh yellow beans from the garden. A tangy home-made bar-b-que sauce with a bite you'll love! 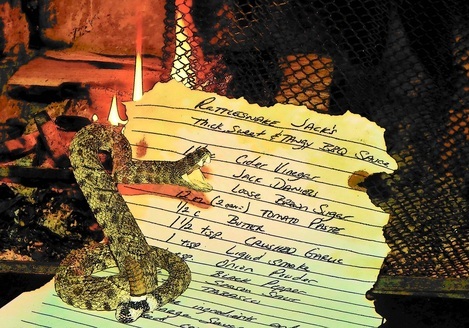 The Michigan Connection: There is only one rattlesnake in Michigan, the shy Eastern Massasauga, and in the very rare circumstance it can be a killer. This BBQ sauce, too, is a killer - in a culinary sense. Preparation: Combine ingredients and simmer in a large sauce pan until desired consistency. All who have eaten Great Lakes Whitefish say that they never grow tired of it. The Michigan Connection: Native Americans and early European explorers ceremoniously caught and eagerly consumed the Great Lakes whitefish; a fish as big as the largest New England cod, but with a much better flavor. It is called in the native language Atticameg, and in ours ‘whitefish’, because of its firm and very white flesh. Preparation: Rinse fish in cold water; pat dry. In a shallow bowl, combine the cheese, cracker crumbs, cornmeal, garlic salt and pepper. In another bowl, beat eggs and milk. Dip fish in the mixture, then gently roll in the crumb mixture. In a skillet, fry fish in oil for 5 minutes or until it flakes easily with a fork, turning once. Cover skillet and add the tomatoes and fresh thyme sprigs during the last few minutes of frying to maximize their flavors. Serve over white rice and garnish with lemon wedges.